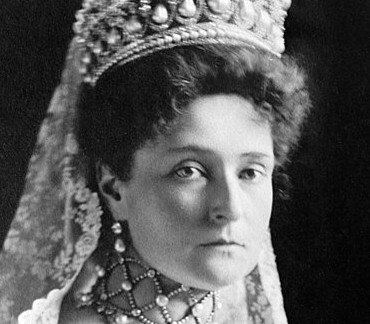 Alexandra is best remembered as the last Tsaritsa of Russia, and for her support of autocratic control over the country. Her friendship with the Russian mystic and holy man, Grigori Rasputin, was also an important factor in her life. The Imperial family and all those who chose to accompany them into exile were executed by Bolsheviks in Yekaterinburg on 17 July 1918. In 2000, Alexandra was canonised as a passion bearer, by the Russian Orthodox Church together with her husband Nicholas II, their children and others including her sister Grand Duchess Elizabeth and the Grand Duchess' fellow nun Varvara. letzte Kaiserin von Rußland (1872-1918). 5 autograph lettercards signed with her initial ("A" or "AF"). Meist o. O. u. D. Zusammen 10 SS. auf 5 Bll. 12mo. Zusammen mit einem Portrait, einem metallischen Abguß des russischen Staatswappens und einem gravierten Namensschildchen in Passepartout (530:360 mm). 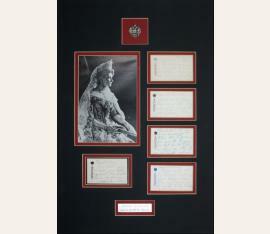 An excellent, rare series of five autograph lettercards signed, all written on both sides of her attractive printed correspondence cards and featuring her name in Russian beneath an embossed crown and printed in either blue, gold or black. 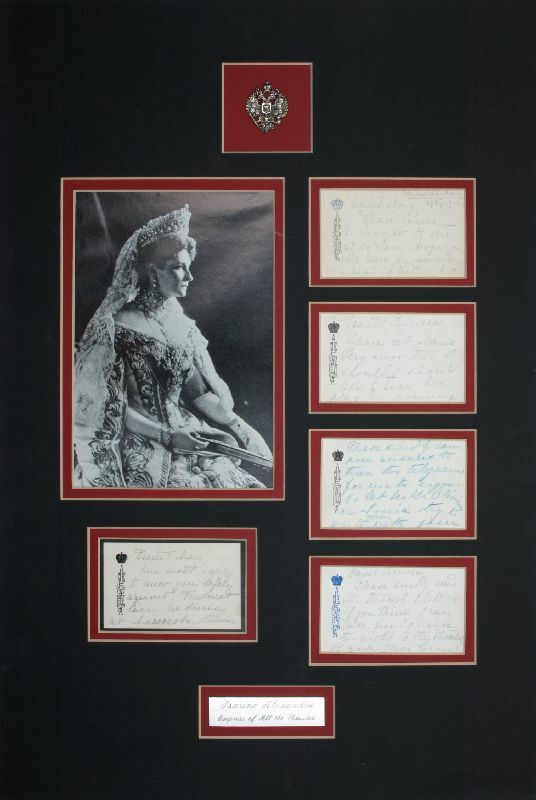 All to Queen Mary ("Dearest Mary", "Dearest Princess"), the Queen consort of Alexandra's first cousin, King George V. Each of the cards is written in English by the Empress in bold pencil (one in blue indelible pencil). - "Please come tomorrow to me at 5 o'clock [...] My head is better, but not my heart nor my forces but God gives necessary strength I trust". - "Please let Maria Pery know that I should [...] like to hear her play this evening at 9". - "Please kindly compose answers to these two telegrams for me to sign. Do let [...] Sonia try to write them with your help, as later I shall have to ask [...] + and they will find it difficult". - "Please kindly read this through & tell me if you think I can take my Cousin to-night to the theatre. If you can bring it back at 11 I shall be home & glad to see you". - "Am most happy to know you safely arrived. Tenderest love. Are dining at [...] otherwise should have peeped into your room. Sleep well. Am well tho tired after journey & emotion"..